Today I started to learn drawing from the wonderful teacher who happens to be living in the same apartment of mine. Whenever I tried to draw something, I tended to get very scared. Perhaps my unpleasant middle school memories where I was one of the WORST drawing students in the art class, had kept me from drawing anything. Now I am planning a train trip across the US in late July, I wanted to become like one of those cool people who draw something (like in their sooooooo cool Moleskin notebook! ), I cautiously reached out to the teacher and she so gratefully accepted me as a student. This picture is the one I drew right after I got back from the first lesson, using charcoal. The teacher told me to look at some of Seurat’s charcoal paintings, no, no, I mean drawings!, …so I did. And among eye opening drawings (I never imagined so much can be done with that simple charcoal!) this drawing of a cat just caught my heart right away. So I tried to mimic him and came up with this drawing. 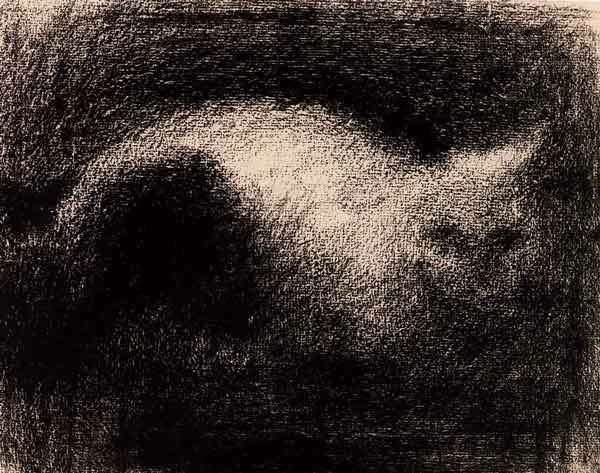 Hmm… my cat looks very uncomfortable compared to Seurat’s, but well… it is my first day!